Spider monkeys are small primates that spend their days high in the tops of trees. They live in rain forests, traveling from area to area in search of food. Their brains are less complex than most primates and they do not have opposable thumbs. Spider monkeys have slender, dark-haired bodies and long arms. Their playful appearance and small nature make them quite popular on the black market. They are often sold as pets around the world. Spider monkeys can breed year round; however, births are usually spaced three years apart. Gestation lasts between 200 and 230 days. Typically one baby is born at a time, although twin births are possible. The mother will nurse the baby monkey for two years. Very young babies will cling just under the mother’s breast until about five months of age, when they will then begin riding on their mother’s back for the next year and a half. After age two, a young monkey will stay near his mother, but will transport himself. The juvenile will explore close by with other monkeys of similar age. Spider monkeys are small, usually weighing no more than 15 pounds. Their svelte frame is covered with darkly colored fur except for their stomach area, which is reddish brown. Customized for grabbing, their tails are prehensile. The tip of the tail is bare, giving them an extra finger-like appendage. Their actual fingers are long and slender; perfect for climbing, reaching and grabbing. 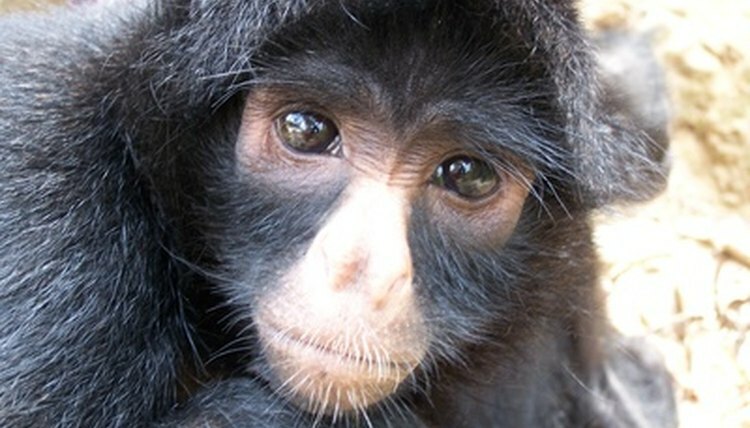 Male and female spider monkeys lead different lives with different jobs in their communities. During times of great food abundance, both sexes live together in groups of about 100 monkeys. When times are leaner, they branch off, forming smaller groups of two to 20. Male spider monkeys always stay with the group they were born in while the female spider monkey tends to roam from clan to clan. The males serve as protectors for their groups. They work together to guard the territory, sometimes employing ingenious methods of attack like dropping heavy tree branches on predators. Males lead less active lives and spend their days roaming independently. Female spider monkeys often have a cub riding on them or walking beside them. They are the more active gender and are much better at acquiring food. The only association between the adult group members is between female and her offspring. Females will groom their babies, play with them and teach them how to scavenge for food. The life of spider monkeys is low-key. They sleep high in trees to prevent attack from predators. They play during the day as they search for food like fruits and nuts, which make up 90 percent of their diet. They move easily through the forests, relying on their tiny bodies to help them glide through the trees. They are nonviolent and prefer to retreat from enemies rather than fight. They are also long-lived, reaching ages of nearly 50 years in captivity.